San Francisco’s preliminary plan to make part of Stockton Street a car-free pedestrian walkway may be threatened by opposition from Chinatown community organizer Rose Pak. n her letter, Pak wrote on behalf of the San Francisco Chinese Chamber of Commerce that the neighborhood “understood we would suffer” inconveniences due to construction of the Central Subway, but believed they would be temporary. The proposal would need to go before the SFMTA Board of Directors for community input and subsequent approval, which hasn’t yet been scheduled, said SFMTA spokesperson Paul Rose. Karin Flood, executive director of the Union Square Business Improvement District said property owners on Stockton Street generally support the project. “They’ve seen it as a boost to sales,” she said. Pak later told the Examiner she met with Reiskin to discuss Chinatown’s concerns. She said “he apologized they never did a better job of outreach” to the Chinatown community, and “he has agreed” the project would not work, because closing that section of Stockton Street would stop the flow of traffic into Chinatown and harm businesses. Rose is wise to see the folly in the plan to cut Chinatown off from the rest of the city. When is the SFMTA and City Hall going to consider how dangerous it is to cut a neighborhood out of the normal traffic pattern of the city? How will trucks and other regular delivery services get to Chinatown with no easy access? How will emergency vehicles get in and out? Many people could be trapped in an emergency evacuation situation. Motorists took nearly 1.9 million trips on Interstate 580’s new express lanes in Alameda County in the first four months the lanes opened to vehicle traffic earlier this year, according to a recent report. The $345 million project opened on the notoriously congested Tri-Valley corridor in mid-February to solo drivers, who pay an extra toll to use the lane, and to carpoolers, who can drive for free. The first full month of operation saw around 549,000 trips along the east- and westbound lanes, growing to 647,000 trips in May — an 18 percent increase from March — according to a report presented to the Alameda County Transportation Commission on Thursday. Tess Lengyel, ACTC’s executive director of planning and policy, said motorists are already seeing the benefits. Average hourly speeds in the express lanes are estimated to be between 10 and 33 mph faster than the average hourly speeds in general purpose lanes during the morning rush-hour commute, according to the report. So far, Lengyel said there’s been a bit of a learning curve to using the lanes correctly. The majority of motorists — or around 67 percent — were either carpool or HOV-qualifying vehicles with a valid FasTrak Flex tag, or single-occupant cars with either a flex or standard FasTrak tag, which is required to use the lane. The remaining 33 percent either had no tags or invalid tags, according to the report. “It’s a new system, so people are just getting familiar with the lane,” she said, adding that the agency has been seeing more people adopting the correct toll tags. A key electrical component of BART’s new train cars has failed recent performance tests due to overheating, creating the possibility of a delay in getting the new fleet in service, NBC Bay Area has learned. July 29–The U.S. Department of Transportation will award $6.3 million to the city of Oakland and BART to support renovations to the 19th Street BART Station and nearby streets, officials said Thursday. The transportation agency and the city partnered to apply for a government grant to help fund the $28.7 million Gateway to Oakland Uptown — or Go Uptown — project aimed at revitalizing the Uptown district. A portion of the funds will go toward replacing aging BART infrastructure, modernizing the 42-year-old 19th Street station with new glass elevators at its north end and interior upgrades like art features, glass fare barriers, and energy efficient LED lighting, officials said. Riders will also have a new entrance directly into the old Sears building. In addition, officials said, several blocks along 20th Street between Broadway and Harrison Street will receive improvements such as widened sidewalks, new bike lanes and street lighting upgrades. City officials said $4.8 million will go toward BART station projects and $1.5 million will fund city projects improving connections to the station. Construction of the initial phase of renovations was set to begin in 2017, officials said. This is the story. Now let’s see what happens. Note the use of the words “renovation, replace and modernize”, rather than repair. Maybe that is what we should be asking for instead of maintenance and operations money. We want to renovate, replace and modernize the Muni buses by replacing the buses and parts that don’t work. Citing flaws in how the environmental impact report was conducted, a Contra Costa Superior Court Judge handed down a final ruling on the proposed BNSF Railway’s Southern California International Gateway (SCIG) project, stating that the Port and City of Los Angeles must complete “a more robust and accurate analysis” of possible environmental impacts before proceeding. The announcement comes after over three years of contentious litigation and protests from communities that stood to be impacted by the rail-yard, especially those in West Long Beach. A number of groups, including the City of Long Beach, Long Beach Unified School District and the South Coast Air Quality Management District were among the original petitioners that filed suit after LA and its port adopted the EIR in 2013. As a decision nears on a critical lawsuit delaying construction of the Golden State Warriors’ planned San Francisco arena, opponents of the project have lost their high-powered legal and public relations teams. High-profile law firm Boies, Schiller & Flexner LLP in April exited the Mission Bay Alliance’s cases against the Warriors and the University of California, San Francisco, and now the group’s strategic and PR consultants, Sam Singer‘s Singer & Associates, is out of the lineup. The move comes only days — perhaps hours — before San Francisco Superior Court Judge Garrett Wong is expected to decide the Mission Bay Alliance’s suit against various San Francisco city government agencies and boards over the environmental review process for the $1 billion, privately funded, 18,000-seat arena. The alliance is a loose coalition of UCSF benefactors — including Chiron Corp. founder Bill Rutter and former UCSF administrator Bruce Spaulding — current and former faculty and nurses at the UCSF Medical Center at Mission Bay. Yet many members of the group haven’t gone public with their support and the group’s agenda, direction and motives haven’t always been clear. The alliance has threatened over the past year to continue to sue to force the Warriors to delay and potentially move the arena project from a vacant lot on Third Street, across from UCSF. The long-range plan for the site should be controlled by UCSF, they argue, to accommodate for future growth of its decade-old Mission Bay campus, though UCSF has no plans for the property. An architectural consultant for the Central Subway project overcharged The City, according to a review of the project’s finances. The Office of the Controller’s City Services Auditor Division released a report Wednesday alleging Dr. Sauer & Partners Corporation must reduce the amount it billed the San Francisco Municipal Transportation Agency. Dr. Sauer & Partners, an architectural consultant specializing in tunnels and underground facilities, may owe the SFMTA as much as $24,483 due to its miscalculations, according to the Controller’s Office report. A $3.5 billion bond that BART will be asking voters to approve on the November ballot will ultimately cost the average homeowner twice what the agency has originally projected, a new report says, and would continue to tax voters for almost 50 years. The beleaguered rapid transit system decided on June 9 to ask voters in San Francisco, Alameda and Contra Costa counties for a $3.5 billion “mega-bond” in November, a measure that needed a two-third majority to pass and which will up the amount each household pays for the transit system. But the agency’s initial projections that the bond will cost the average homeowner $35 to $55 in property tax annually for 30 years is in fact going to be roughly twice that and will last for 48 years, writes East Bay Times columnist Daniel Borenstein, who cites BART’s own projections. The ballot language itself won’t even mention how much each homeowner can expect to pay for the BART bond. “Matthew Burrows, BART’s general counsel, gave the board two reasons for the omission. First, he said, with the ballot language limited to 75 words, there wasn’t room to mention the tax. That’s bogus. Second, the planned ballot wording had tested best in a voter opinion poll. In other words, the political ends justify the means,” Borenstein writes. So far, BART appears to have enough support to pass the measure in Alameda and San Francisco, but is not seeing nearly as much support in Contra Costa, where two BART strikes in 2013 left commuters disgruntled. BART, which has seen an 6 percent increase in ridership every year for the last three years, conducted a poll last summer that found 76 percent of respondents would vote for a $2.5 billion bond measure for the system. It appears there is a cheaper alternative to extending BART. More to come on that soon, but this will get you started. THE board of Californian commuter rail operator Caltrain has approved contracts with a total value of $US 1.25bn for the electrification of the San Francisco – San Jose line, together with a new fleet of electric trains for the 82km route. Balfour Beatty Infrastructure has been selected for a design-build contract to electrify the line, while Stadler USA will supply a fleet of double-deck EMUs to replace the locomotive-hauled trains currently in operation. The request for proposals specifies eight-car trains, although some stations will only initially accommodate six-car sets. the order will be for 96 vehicles with an option for 20 additional cars. The 25kV 60Hz ac trains will initially operate at up to 127km/h, but will need to be capable of 177km/h running for blended operation with California High-Speed services, which will also use the San Francisco – San Jose line. Blended operation is expected to begin in 2026-29 with six Caltrain and four high-speed services per hour anticipated at peak times. COMPLEXITY AND SIMPLICITY : When confronting complexity, simplicity is a worthy first endeavor. Historically, even war has been resolved by simple “treaties” by marriage. The complex universe has been clarified by simple mathematical equations. All cultures have forms of simple unifying traditions, celebrations, foods, drink and merriment—a commonality. Despite trillions of dollars in expenditures, societal ills persist. Whether it be poverty, homelessness, education, transportation or international relations, isn’t it logical to aim resources at quick and relatively inexpensive solutions? How one person and a small team can change the world, with free clean electricity by human-powered generators, clean energy by tapping the Earth’s heat, fresh water by desalination farms on barges, health improvement…. DIVERSITY: AN INNOVATION MELTING POT: For 240 years of American history, and a blink of time relative to other nations, a uniquely American confluence of cultures and ideas has begun a global experiment, which unites the many under democratic principles, law, liberty and justice for all. The strength and stability of the American society continues to be a beacon for people all over the world. This melting pot fuels America’s dynamism and palpably connects to every corner of the globe. Just how much has the United States depended on immigrants to build itself throughout its history? This chart lays out the last few hundred years of the nation’s immigration rates to show how pivotal it was. CASE STUDY: HOMELESSNESS : As in the past, solving homelessness requires simply organization, design and speed. After the 1906 earthquake, 225,000 of the City’s 400,000 population were homeless. Quick and relatively inexpensive solutions followed—for shelter, food, hygiene and societal infrastructure. Pending housing solutions, even tents can be organized and linked to basic human needs. Poverty and homelessness are not new. Many social safety nets arose from past crises. We’re now better equipped to solve homelessness. But unlike the past, when cheap lodging was a small fraction of weekly wages (25¢, 50¢, $1, $2…a night), the room-by-the-day, boarding houses, single-room occupancies and backyard shacks have disappeared. 48 HILLS: Why are so many people homeless in SF? People who are homeless must have done something wrong with their lives. Even the rare sympathetic news media coverage focuses on drugs, mental illness, crime, job losses … there is never the suggestion that people who live on the streets are victims of a system that the political leadership either helped create or tolerates. In reality, it is not the fault of the people who live on the streets; it’s our fault for forcing human beings to live there. The message is that homeless people are different from the rest of us, that it must be their fault that they squat on blankets (huh?) and hold out hands. They are The Other, to be feared, and shunned, and patronized. We have created this situation. And now we do a special project with hundreds of stories that ask why, oh why, are there are so many homeless people on the streets. Go figure. Berkeley professor explains that it’s not about Nimbys, it’s about capital markets, speculation, too much demand, and income inequality. And he argues, correctly, that the housing crisis has more to do with speculation, finance, and economic inequality than with any claim that cities like San Francisco are too slow to build housing. But developers are profit-seekers, so don’t expect them to be innocent bearers of what people need. It is absolutely necessary to question developers and city planners over what is to be built, how high, how big, and where. A livable city demands good design, historic preservation, neighborhood protections, mixed use, and social diversity, among other things, and figuring out what those things are should be a collective, democratic and, yes, conflictual process of politics and public debate. 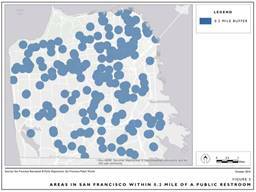 To determine where new Pit Stop restrooms would make the largest impact, the Controller’s office mapped all 274 publicly accessible restrooms in the city, including toilets maintained by the SF Public Library, Rec and Parks, the police and fire departments and other city departments. Under the assumption that people are willing to walk up to 0.2 miles to access a restroom, the department then mapped the vicinities covered by existing public toilets. While the Pit Stop program is intended for both locals and tourists, representatives of the Controller’s office said they wanted to narrow in on accessibility for homeless San Franciscans in particular. Therefore, they removed public toilets in fire and police departments, assuming that many homeless residents would not feel comfortable going to those locations to use the restroom. NEW GREEN, SELF-SUSTAINING CITIES: Avoiding high construction costs and long timeframes in existing cities, new green cities may make more sense. Due to its compact size, San Francisco is already denser than Hong Kong and Tokyo. Rather than overstressing old infrastructure, new self-sustaining cities could produce their own energy/ water, recycle 100%, eliminate waste/ pollution, minimize cars, innovate public transit, centralize jobs and stabilize housing costs by design. Zero Energy Communities are communities that have committed to moving to net zero – producing as much energy as the community consumes. Ed Mazria of Architecture 2030 describes his blueprint for a Zero Energy World in this video. Below is a description of what is happening in several cities in North America who are aspiring to become Zero Net Cities. PulteGroup’s reveals its newest innovation, an invisible house in Brentwood, California, which is an environmentally friendly zero net energy prototype working to erase its carbon footprint. Most Inspiring TV ad: “All the Good” (Hillary Clinton) Often called the voice of God, actor Morgan Freeman has portrayed God twice and the U.S. President twice. Most unique TV ad: Jane Kim as a fighter.